A California government oversight commission is suggesting that a private organization may be better suited to operate Hearst Castle than the State Parks system. In a section titled, “Should Hearst Castle be in the State Park System?” the Little Hoover Commission floated the idea of the state turning over Hearst Castle’s European art collection to the Getty Museum. Although the castle brings in more than $1 million a year and is the third highest revenue generator for the state parks system, its annual operating, maintenance and restoration costs exceed its income. The castle currently has an estimated $60 million in deferred maintenance costs. Putting a new roof on the north wing alone is expected to cost the state $1.8 million, the report says. William Randolph Hearst’s family deeded his 115-room hilltop castle to the state in 1958. A 1979 Los Angeles Times report stated that Hearst initially willed the property to the University of California, which then recommended it become a state park because it could not afford the upkeep. The governor and legislature appointed Little Hoover Commission now says that state parks allocations for the castle “do not begin to keep pace” with its maintenance and restoration needs. How about we “outsource” the government? conducts public hearings and visits government operations in action. 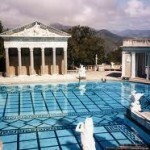 Should Hearst Castle be in the State Park System? Museums Division, Department of Parks and Recreation. June 5, 2010. Sacramento, CA. Personal communication. Also, Friends of Hearst Castle. 2013. “Find to Fund” website. http://www.findtofund.com/friends-of-hearst-castle-203.html. If you want to know why government has become so screwed up it is surely partly due to garbage like this so called “report”. I particularly like the source of Jack McDonald from 1979. Yep, a 34 year old source. We, the taxpayers of California, paid lord knows how much money for this worthless report. Privatize as much as possible. The only thing the government does really well is create more government, rules and bureaucracies. But with the Dems in charge it will never happen. They would rather see the system collapse than give it to the evil corporations to run efficiently. I say save the State Castle and outsource the State Prisons. This is where competition, diversity and many buzz words will add up to a balanced budget. The only thing wrong with your idea is that our justice system and laws are too screwed up and we would be sending too many people away that were either outright innocent or guilty of relatively trivial offenses. Yes there are cases where the innocent is punished by our judicial system but there are far more victims of drive by shootings or CalTrans safety issues that have not met the death threshold for funding. Yes people do die first or expensive litigation cost to the State before we fix our roads. OnTheOtherHand I do agree that we should not knowningly risk the health and safety of any individual but something as highly funded by taxes from the fuel pumps, CalTrans, death means it’s finally time to do something. Yes they have politically lofty words that discribe justification but mine are straight to the point. Typical of State Parks and how they operate. They spend most every penny they get on their own salaries and benefits and leave next to nothing for maintenance and repairs. They bog themselves down so far in red tape and such that it’s next to impossible to fix things for the local level maintenance crews. Most anything they want to do on a local level has to first be requested and approved, then studied, designed and then okayed by Sacramento and if there is anything about the project design that has to be changed, the designer has to come down from Sacramento and look at it and study it and officially make changes. They don’t allow the local maintenance folks to do anything on the fly, which is the backbone of any maintenance crew. For example, did you know that if a state park worker needs to use a respirator for anything, like using a blowtorch or spraying herbicides, he first has to go to the doctor to prove that he doesn’t have any lung infections or breathing problems and if he passes, then he can put on a respirator, which is designed to protect the lungs in the first place? It’s that sort of bureaucratic crap that’s handcuffed the few guys in State Parks that have the pride to make sure their particular park is ship-shape. That sort of bureaucracy wears a guy down. They leave so little money for maintenance that stuff is deferred year after year until it then becomes too costly to fix and they have to ask for even more money to fix what’s now become a crisis. If that roof of Hearst Castle collapses, kiss all the artworks in that building good-bye. Maybe turning it over to the Getty Museum is a good thing. Or they could turn it over to some super-rich fancy hotel chain that would invest the money needed to restore it and then use it for a $1,000 a night B&B or a $2,000 a day spa for the rich and famous. And turn the only IMax theater for more than a 100 miles in every direction into a true movie theater and play stuff that people actually want to see. I agree. It’s shameful that our state system has deteriorated to this point. They have however only themselves to blame for this mess. Decades of excess including fat budgets with little accountability have led us down this path. I know several people who once worked at the castle as groundskeepers and they openly admitted that had little or nothing to do unless a leaf fell from a tree or plant, then they would run and grab it…and return to doing nothing. They said they did this most of their castle career. The entire state system is built on a false foundation that cannot sustain austere times. In the case saw, I was doing 15 days of community service at MB State Park and myself and a maintenance worker got sent to Montana de Oro to get rid of an old Army surplus trailer, the kind you pull behind a Jeep and some old galvanized pipe that used to be a horse corral. The guy fired up an acetylene torch and started cutting up the trailer. I asked him if he knew what kind off paint was on the old trailer, which was probably from WWII or Korea (Maybe Vietnam) eras. I told him if it was Army surplus that old it was for sure lead paint. This freaked him out and he called his boss back at MB St Park who then drove all the way out there and took over the torch work and cut it all up. I used to work in a welding supply warehouse and I knew that cutting up galvanized pipe with a blowtorch gives off some nasty fumes and such. The boss used a respirator with no questions asked, I don’t think he cared about having to prove that you are healthy before using a simple rubber mask with charcoal filters because he’d actually worked in a maintenance crew before working for the state. Another example during this same time, the same worker and I were sent to Harmony Headlands to install a whole bunch of signs on metal poles, which we drove into the ground with a stake driver. He had this ridiculous hand-drawn map of where the signs had to be installed that was drawn up by some guy in Sacramento. The map was so crude that my partner couldn’t figure out where the signs were supposed to go. They also had to be driven into th ground 24 inches, exactly, and had to be perfectly vertical otherwise we’d have to go back out and redo them. And there were a couple dozen of these signs that had two different messages. Now this was installing pole signs along a dirt road in a passive recreation park that’s supposed to be left in a natural state. To me, a normal common-sense based thinker, I couldn’t see what difference it made if the signs were 5 feet this way or that. He called his boss again, who drive all the way out to Harmony Headlands and we drove the roadway and he tried to figure out where exasctly the signs had to be installed. Otherwise the guy from Sacramento would have to drive down here and specify where exactly the signes were intended to go in. It was done like some exacting project as if putting a sign a few feet or yards further down the road actually made a difference. Frankly, I think they could just have put one big sign at the entrance that told people to stay on the trail since there is absolutely zero enforcement anyway. It took about 4 hours just to figure out where to put the signs and frankly, we could have had every sign installed in a day but it ended up taking two and a half days. I watched another guy take about 2 hours to paint an 12-foot metal light pole at the Natural History Museum. He was up and down a ladder over and over and over again, doing what no real painter would ever do. That’s the kind of nonsense that I’m talking about. Those 15 days of working in that park opened my eyes up to the way the state parks’ maintenance works and I gotta say it was pretty disgusting, considering these guys were making $17+ an hour. I guess my whole point is that the state doesn’t give it’s people the freedom to fix things when they break and maintain the parks the way they should be. And don’t even get me started about the Morro Strand Campground, which has the most disgusting bathrooms and yet they’re going to spend a million bucks to put in RV spaces with full hookups but aren’t putting in hot showers nor even outdoor cold water rinse off showers because that’s part of a statewide ADA upgrade program… ad nauseum. More like a million a week. I agree with much of what you said but the bit about requiring medical approval before using a respirator may actually make sense for SOME types of respirators. They may protect from some hazardous pollutants but are not without some hazards themselves and should only be used by someone in good health. Ask the folks who have had military training for “chemical weapons” defense measures about extended use of such equipment. Additionally, each individual must pass a qualitative, and quantitative fit test to ensure proper use. This requirement is not just limited to state employees. Rumor has it that the Koch bros. are trying for a package deal; buying the L.A. Times and Hearst’s Castle. Well maybe if they didn’t rent it out to special people at a bargin rate they’d not be in as big of a hole.